Whether you are a seasoned bullet journaler or just getting ready to start your first bullet journal, you have probably noticed that there are many different styles. Looking around Instagram you will quickly see self-described minimalist along with bullet journals that look like art journals, so how do you decide the best bullet journal notebook for you? Well, the truth is, there is no perfect notebook to use as your bullet journal. Which notebook is best for you is going to greatly depend on how you plan on using your bullet journal. This post will break down the notebooks that will best fit your style whether that is artistic, minimalist, or somewhere in between. If you are new to bullet journaling, you might be a bit overwhelmed. First, I would suggest you read this guide to get your footing in bullet journaling, and second, I recommend you keep it simple. Just grab something that meets your basic needs and try not to stress about finding the perfect journal. My first bullet journal notebook was a bit on the nicer end, and since I am a minimalist, it was more than I needed. Here are some options that are great for keeping it simple. The Scribbles That Matter notebook has quickly become a favorite notebook in the bullet journal community. This bullet journal notebook has a simple design but also includes a few of the key components of any bullet journal. 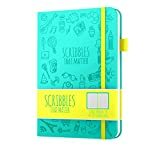 The Scribbles That Matter notebook comes with a preprinted key and index page to help you quickly organize your bullet journal. This notebook has hearty 100gsm paper that is strong enough to handle most pens with little trouble. Available in ten different color combinations at an affordable price, Scribbles That Matter is a great option. 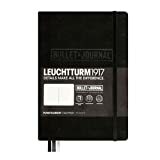 The Leuchtturm1917 is by far one of the most popular bullet journal notebooks, and they have teamed up with Ryder Carroll to create an official bullet journal notebook. The biggest difference between the official version and the standard 1917 (discussed below) is the preprinted pages. The official notebook includes a preprinted index and key and is designed to help you set up a traditional bullet journal setup. This notebook is excellent if you intend on keeping a minimalist bullet journal. The Rhodiarama lacks the preprinted elements of the previous notebooks. However, it makes up for this by providing a dot grid with plenty of room to customize. It’s worth noting that this notebook only contains 160 pages, compared to the 200+ in a Scribbles That Matter. The Rhodiarama notebook provides a wide variety of colors, but do note that all versions include their trademark orange accent. You can see the Rhodiarama in action here. This notebook from Rhodia is a solid choice for someone that wants a blank canvas. This notebook is one of the most inexpensive options on this list, but that doesn’t mean that it lacks quality. This notebook has 90gsm paper that will keep ghosting to a minimum. Like the Rhodiarama, the Northbooks dot grid notebook lacks any preprinted bullet journal pages. One major drawback of this notebook is that it is only available in black and grey. The Northbooks notebook is a fantastic and affordable option for your first bullet journal notebook. This journal provides 120gsm paper that will be able to take most types of pens without any risk of bleeding or smearing. Lemome’s classic notebook includes a built-in pen loop and is available in lined, graph, or dot grid paper. The notebook is fantastic as either a bullet journal notebook or as a dedicated morning pages journal. This notebook from Lemone is ideal for anyone who wants to use wet pens, such as fountain pens. PERFECT FOR ENGINEERS AND DESIGNERS - Our 5 mm grided graph pages are great for anyone who makes diagrams, mock-ups, or designs, and the grid lines blend in once the page is filled. Although I am a minimalist, Shelby has always been significantly more artistic in her bullet journal. By using her bullet journal as an outlet for her art, she has been able to unlock creative energy that has helped her blossom into a fantastic artist. Keeping an artistic bullet journal is a great opportunity to get back in touch with your creative side. The Leuchtturm1917 is and has been for many years a favorite in the bullet journal community. A Leuchtturm1917 was my first bullet journal and is a truly fantastic notebook. Although the Leuchtturm1917 only has 80gsm paper, we have put this journal through hell and it held up beautifully. Almost a year ago, the Leuchtturm1917 was put through a harsh watercolor test. Surprisingly, despite its lighter weight paper, we saw no bleeding. Additionally, we have used the Leuchtturm1917 extensively for hand lettering and have never had a problem with bleeding or too much ghosting. The Leuchtturm1917 is my go-to bullet journal notebook, and I highly recommend it for any journaler. 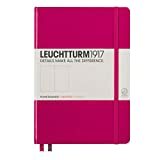 If you want to learn more about what this journal has to offer, then check out this complete Leuchtturm1917 review. Moleskine’s classic notebook was also on the receiving end of the intense watercolor test. Though the Moleskine did not fare quite as well as the Leuchtturm, it still performed better than expected. The Moleskine notebook’s lightweight paper is not ideal for watercoloring but is a solid option for drawing and sketching. Make sure to read our complete review of the Moleskine. Overall the Moleskine is a fantastic notebook for anyone wanting to add a bit of art to their bullet journal. Alright, so I admit that a watercolor sketchbook hardly qualifies as a “notebook.” Nonetheless, I felt like I had to include it. Too often when considering options, people fail to think outside the box and consider different ways to meet their needs. The Moleskine watercolor sketchbook served as the centerpiece of the Month in Color series. As a result, I can say with absolute certainty that this sketchbook can handle anything you want to throw at it. The sketchbook uses heavy duty 200gsm paper that will not bat an eye as you throw layer upon layer of watercolor on it. Don’t believe me? Just check out this video. Picking the right notebook to start your bullet journal can be daunting, but the important thing is not to overthink it. If you find a bullet journal notebook that you think is a good fit, then it probably is. There is no guarantee that it will be the perfect fit for you, but the experience will help you determine what you need from your journal in the future. 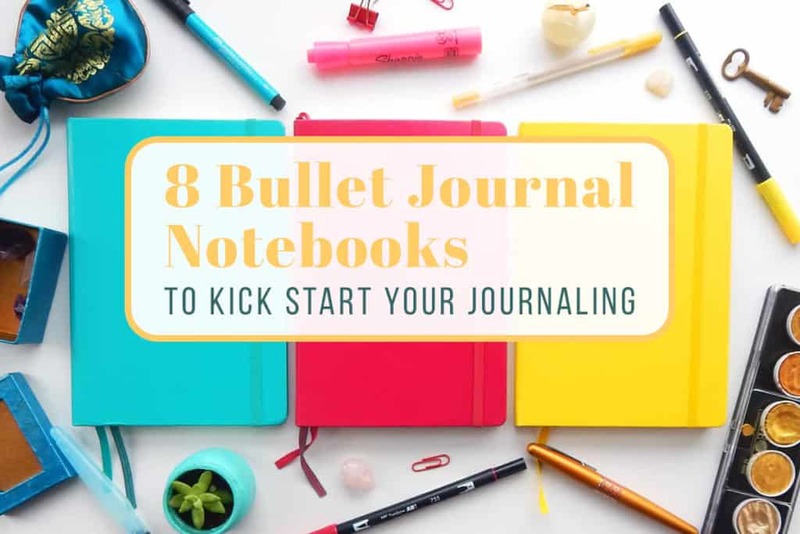 If you’re pumped and ready to dive into bullet journaling headfirst, then make sure check out our favorite bullet journal supplies here. « My Honest Moleskine Classic Notebook Review – Is It Worth the Hype? I just got an A5 Clairefontaine “My Essential” notebook! Great fountain pen friendly paper. It has an index and is paginated. Look forward to using it to Bullet Journal!!! Have you guys tried Archer and Olive’s dot grid?? Amazing paper quality for someone wanting to do a lot of art in their journal! I have one to start off in the new year ? I’ve not tried that one Melissa. Thanks for letting us know about it. STM best bullet journal hands down. I’ve tried the A5 but now am absolutely in love with the B6 size. Perfect for me love the paper, the hardy cover but most of all the fantastic customer service! It’s so great when we find one that we love! I’m happy to hear you’re loving Scribbles That Matter, Bonnie. I have a different experience than another commenter with the $5 Fabriano journal — I love it. As she noted, I can write a *lot* of page numbers to save $15, but either mine was better bound, or I got lucky. PROS: The cover is a lovely leatherette that holds up well. There are a LOT of pages, and the binding is elastic enough to allow you to tip in additional pages if you want to add something. (I forgot to add a dream, so I tipped it in. That method is what I would recommend if anyone does encounter problems with loose pages, as well. Run a thin — I mean THIN, almost invisible — line of glue on the very edge of your paper and slot it right back into place. Old library book repair practice 🙂 ) This journal also stands up to being banged about in a bag with lots of other books, papers, and junk. It will take a lot of ink doodling. CONS: The pages are not as heavy as in a good journal (and I used to bind my own, so…) so if you are into a lot of color or use anything other than Tombow Fudenosuke pens and Pitt fineline pens, and do line drawings, then this is not the journal for you because you will get bleedthrough. It’s great to hear it worked really well for you Andrea! I love that we have options, because really there couldn’t ever be one journal that would work for every single person. I’ll share a mistake I made so others don’t have to make it 😉 Don’t skimp on the notebook just to save a few dollars. I’m new to bullet journaling, and after reading many blog posts for recommendations, reviews, and ideas, I knew the most-recommended notebook was the Leuchtturm1917. But the $20 price tag gave me sticker shock, so I went to Blick, the art supply store, looking for a cheaper alternative. I found one by Fabriano for $5, and felt very smart. It didn’t have the pre-printed page numbers, but I can write a lot of page numbers for a $15 saving. Fortunately, I didn’t use it for my “real” BuJo right away — I used it to sketch out ideas for different spreads, make notes, etc. I say “fortunately” because, when I got to the 3rd sheet (page 5&6), the 1st sheet started to detach from the binding. When I got to the 4th sheet, the 1st one fell out entirely, and the 2nd sheet started to detach. And so on. The beginning of this Fabriano notebook now consists of 4 detached sheets, and the 5th is well on its way. At that point I ordered a Leuchtturm1917 for my “real” BuJo, and I’ve loved it ever since. The moral of the story: A penny saved may be a penny earned, but not if it’s penny-wise and pound-foolish. Thanks for sharing your experience Jenny! The Leuchtturm1917 really is worth the price as are some of the other “nicer” bullet journaling notebooks. The pages are thicker than the cheaper options and the notebook in general just holds up better. Thanks bunches Laura! I have not tried that one. I’m several months into my first bullet journal–a Mead 5-squares/inch composition book I got for a dollar during the back to school sales. I’m actually really happy to have started with this because it’s allowed me to experiment and find my way without feeling overly pressured for it to look perfect. I find I actually prefer the extra width enough to be hunting for a B5 notebook when I’m ready to move on. The paper is definitely thinner, but I haven’t had problems with Flair, Ink Joy, or G2 pens. Too often I’ve bought a beautiful notebook to start a new endeavor only to fizzle in a few weeks, in part because I make the project too big and complex at the outset. This time it’s sticking–possibly because bullet journals are intrinsically awesome, but quite possibly because I’ve allowed it to grow organically with flexibility and without expectations. I totally agree that bullet journals are intrinsically awesome Siri! How wonderful that you’ve been able to learn through journaling in your composition book – it’s a great place to start and actually one that you could continue to use if you chose to. 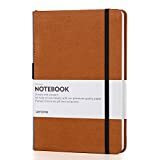 Shelby- you are an enabler- I just put the Lemome’s hardcover classic notebook in my Amazon cart… I swooned when I saw the lined pages were wide ruled. I love to write with my fountain pens on wide rule – also my journaling. So I will just have to have this. That is so funny Charlene! I bet you will be glad for the enabling once it arrives.